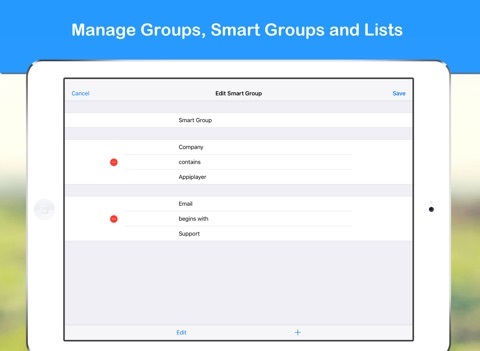 Smart Group helps you  manage groups and smart groups directly from your iPhone. 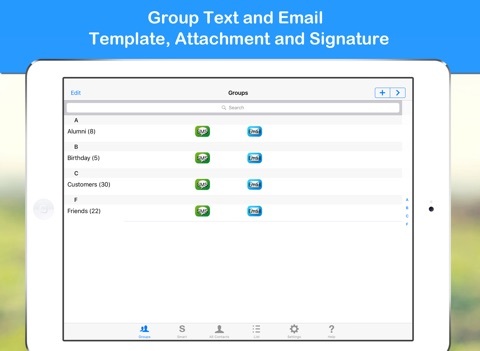 With just a ‘Tap’, you can send SMS / Email to all your group members at once. There is no need to type! ***Send SMS / Email to a group. Does not need to select contacts one by one. ***Send SMS / Email to a distribution list. 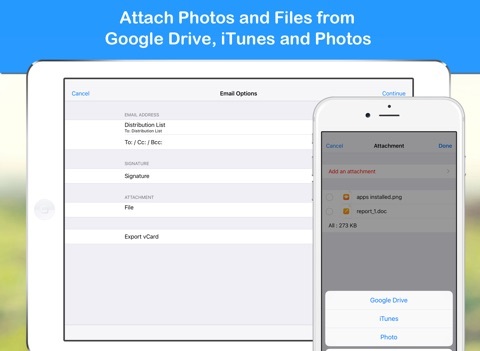 It is very useful if you have contacts with more than one phone number or email. 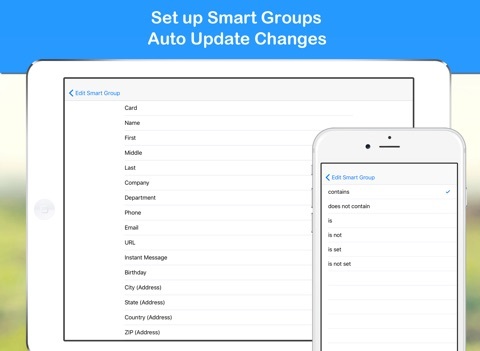 Smart Groups can automatically organize information in your address book. The possibilities are endless with Smart Groups. They can be used on any of the criteria stored and will auto-update whenever a change is made. Some ideas for smart groups. The notes field in Address Book extends the power of Smart Groups just a bit. After returning from London, I added the business cards of people I met and added the note 'London' to each one. I then made a Smart Group where the Note contains 'London' and now I've got an easy way to see the group of people I met at London. To see a list of people, who you do not have a phone number for, set the phone criterion to include entries that are not set. Most companies offer their employees an email address that uses the corporate domain. If you created a smart group for “email” that contains “yourdomain.com” then you will have a group that is always updated with all of your coworkers. 1. Group SMS function needs OS 4.0 or above. Group SMS is only available for iPhone. 2. Email messages are sent through Apple Mail App. SMS messages are sent through Apple Message App. 3. Smart Group and Distribution List support exchange contacts. Group does not support exchange contacts. Please send us emails at [email protected] if you have any questions or comments. We listen to you and support you. We will keep on updating.